On Sunday, February 5, Beijing folk artist Lin Bai will visit the Freer|Sackler as part of our third annual Chinese New Year Celebration. From 12–5 pm, you can watch him demonstrate how to make traditional bristle dolls. This handicraft originated in Beijing more than a century ago, at the end of Qing Dynasty. In the video, you can see how Bai uses traditional materials to connect to the origins of this art form. He constructs the doll’s head and base from plaster, and he uses straw to shape the character’s bodies. The figures are then dressed in colored paper or silk and lined with cotton padding. Bai makes characters inspired by popular operatic plays, including Uproar in Heaven and Four Pairs of Mallets. Each character is secured onto a base with a circle of sticks (or bristles), thus giving the dolls their beloved namesake. Once a collection of dolls is finished, the troupe can be placed onto a copper plate. When hit by a mallet, the figures appear to dance due to the sticks’ flexibility. After watching Bai’s demonstration, you may be inspired to see the dolls come to life in opera performances by students from the Beijing Opera Art’s College at 12:30 and 2:30 pm. Or, you may be tempted to make your own opera mask in the museum’s ImaginAsia classroom. Seating will be first come, first served, and all activities are free and open to the public. For more information (and to invite your friends), check out the event listing on Facebook. 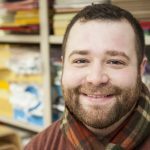 Matthew Lasnoski is the Educator in Youth and Family Programs at the Freer|Sackler.